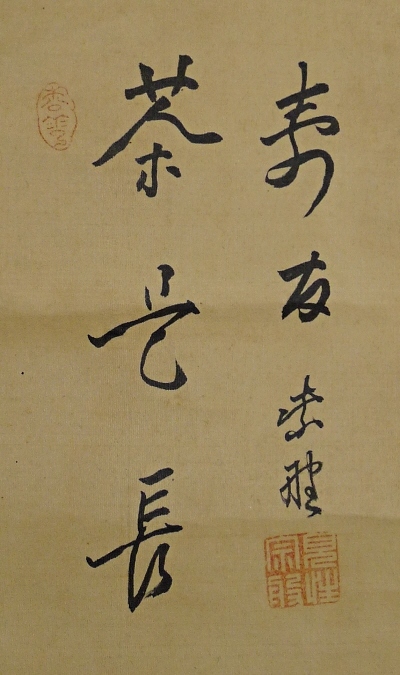 Title" Daruma & Word by High-ranked Buddhist Monk "
Kensho Sohan was the 5th Kancho head of the Daitoku-Ji school of Rinzai-shu Sect of Zen Buddhism. And also he used to be the head priest of the Yawata-Enpuku-Ji Temple in Kyoto. He was born in Kaga Province (present Ishikawa Prefecture) in the first year of the Kaei era (end part of the Tokugawa Shogunate period) and deceased in the 11th year of the Taisho era. There are a breach and a few small holes at the top of the mounting. And there are folds and grazes in whole. 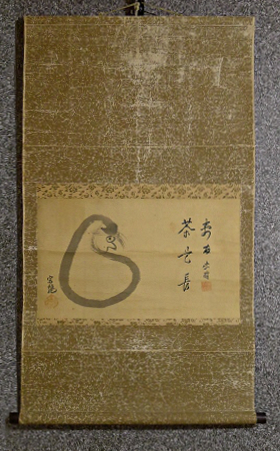 The condition of this scroll is not good. Although, Daruma is drawn very artistically using Fude Japanese brush and Sumi black ink only. 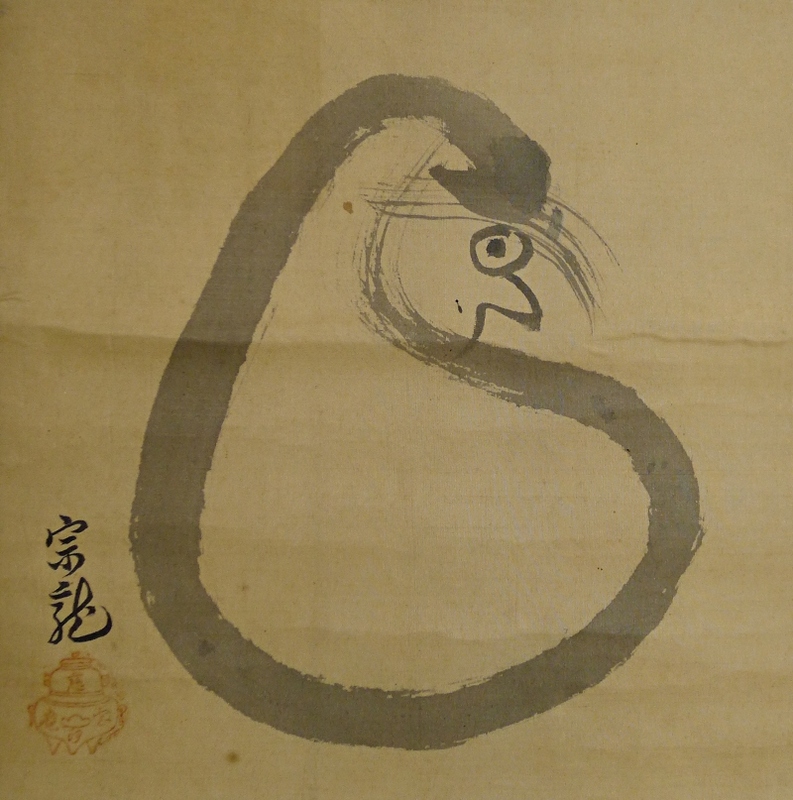 We could not identify the drawer of the Daruma, though, he seems a Buddhist monk from his name. 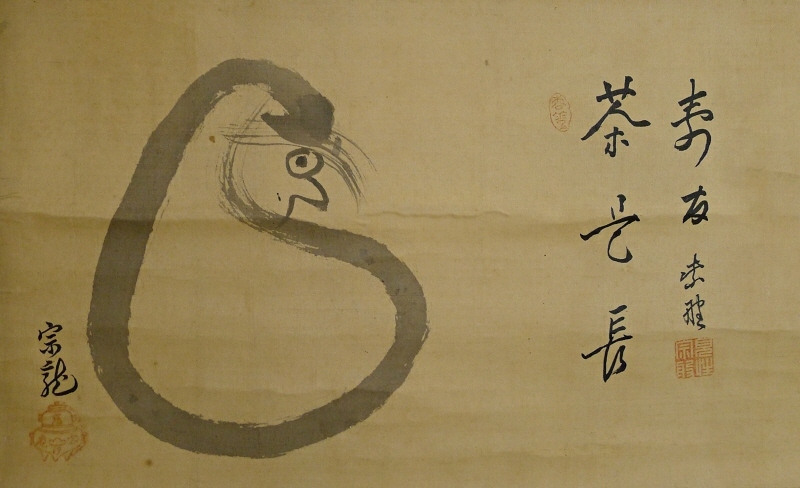 A Zen word is also drawn at right by Kensho Sohan, the top Buddhist monk of the Daitoku-Ji school of Rinzai-Shu Sect. 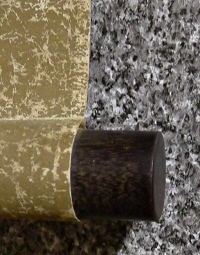 It is very tasteful scroll.